I honestly missed the simplified life so much during my Goldilocks-style planner discovery journey a few years back that when I picked up a Simplified Planner again in 2016, I never looked back. Later this year, I will be purchasing my FIFTH consecutive Simplified Planner and couldn’t be more excited about it!! IS THE SIMPLIFIED PLANNER RIGHT FOR ME? YOUR QUESTIONS ANSWERED!! But I thought it would be fun to create a blog post that includes every question I’ve ever been asked about the Simplified Planner and all of my answers. Sort of an ultimate FAQ resource guide that is equally informative and fabulous to help you determine if the Simplified Planner is the right planner for you!! These are the most frequently of frequently asked questions. There are so many planners on the market—why the Simplified Planner? Because Emily Ley is my spirit animal. (Kidding. Sorta. 🦄) Because it stopped me from making daily to-do lists that just weren’t accomplishable. To-do lists are not wish lists and the Simplified Planner literally changed the way I manage my time and plan my days. The fact that it’s so well-made and gorgeous is really just a bonus. I also love that it’s super simple, not overwhelming, complicated, or demanding. It was designed that way (minimally) on purpose so that every girl in every season could use it. What planner (edition) do you use? Do you *really* use it every day? Yes, I *really* do. I call it my number one productivity tool for a reason. Because it’s the first thing I reach for in the morning, the last thing I touch at night, and the only thing I check in with multiple times each day. I honestly can’t imagine my life or business without it. I’ve bought other planners before but never used them. What should I do? You have to commit to using it. Whether you buy a Simplified Planner or another planner, you have to understand that the planner isn’t going to change your life unless you actively and consistently use it. You just have to commit to it. Make checking in with it part of your daily routines. Set reminders if you have to until it becomes a habit. In my experience, the more you use it, the more you won’t be able to live without it. How do you keep your planner so neat and clean? Honestly, I treat it like a piece of technology. It mostly stays on my desk in my office, but if I do take it with me somewhere, I make sure it goes in my bag coil side up and away from anything that’s wet or sharp. I use a magic eraser on cover smudges, and wite-out tape is my secret weapon because I can’t stand scribbles or cross-outs. Where do you keep your current planner? In the upper right-hand corner of my desk with my pens (black for writing and pink for checking off to-dos) and wite-out sitting right on top of it. You should always leave your planner in the place where you’re going to use it most. Not on a shelf or in a drawer where you’ll hardly ever see it. And don’t you dare leave it in the pretty little box it came in!! What do you do with your old planners? How do you substantiate the price? It’s the only planner I buy. It’s so well-made and gorgeous. It’s my favorite business expense. I actually use it every day and can’t imagine my life or business without it. When it’s a product you’re going to use for 365 days, I believe it’s worth it to spend a little bit more. Besides, when you divide $58 by 365 days, you realize what you pay is worth it. Simplified Planner Launch Day happens twice a year: once in the spring for academic year editions and again in the fall for calendar year editions. They’re honestly my favorite days of the year!! Team Simplified goes all out and so do I!! Do you recommend ordering on launch day? If you have your heart set on a specific planner cover, yes. Some planner covers are more popular than others and tend to sell out pretty fast. What should I do to prepare for launch day? Make your shopping list ahead of time, set multiple alarms for 10am ET, and plan to be at your computer at least 5 minutes before launch time. Do you recommend buying a bundle? If this is your first time buying a Simplified Planner and you want all the coordinating accessories OR you’re low on accessories, absolutely!! It’s a GREAT deal because you get one of everything AND free shipping!! How do you decide between all the gorgeous covers? It really is the hardest decision to make because Team Simplified OUTDOES themselves when it comes to the cover patterns every single time. I’m constantly telling myself I don’t need two, three, or four planners!! How do you decide between Academic and Calendar Year? When does a new year start for you? If it’s when the kids go back to school, you want an Academic Year. But if your fresh start comes in January, get a Calendar Year. How do you decide between Daily and Weekly? Ask yourself what you need more of, space or portability. If you need space and like seeing just one day at a time, I would recommend the Daily. If you need portability and like seeing your whole week at once, then I would say Weekly. What are your favorite planner accessories? The color coding stickers are my all-time favorite. I use them every day and have to order more constantly. I love the Gold Dot and Happy Stripe pens. The stretchy bands are great for travel!! The pineapple paper clips are really fun and I adore the magnetic page markers!! What else do you recommend from Simplified? If you could only order ONE planner accessory with your planner, what would it be? The color coding stickers. I can’t live without them. I get so many questions related to my use of the Simplified Planner and have actually answered most of them in blog posts already. So instead of making this post super long, I’m just going to link them here for you. 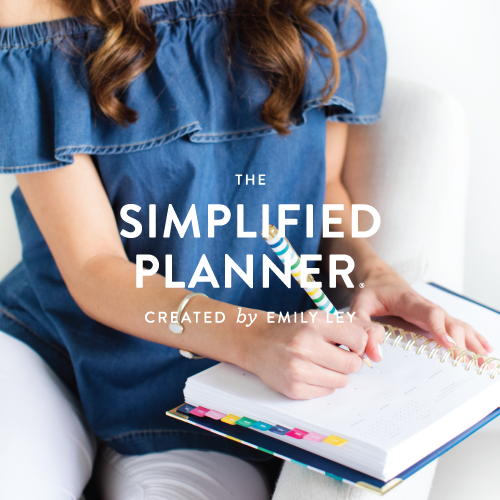 Got a question about the Simplified Planner, accessories, planning, or launch day you’d like me to answer? Ask below and I’ll update this post with my answer!! Disclaimer: This post contains affiliate links. All opinions are my own. I only share about the products and services I personally use and love most and think you will, too!! Grab my kit and get the 411 on what I use to get things done!! Downloading this freebie will also add you to my email list. You may unsubscribe at any time. Hello, and welcome to my little corner of the internet where everything is color-coded, coffee always comes in cute coffee mugs, and office supplies are never in short supply. I'm Alexandra--your resident productivity + systems strategist here to provide you with resources, education, and inspiration for making your passion productive. New here? Start here! What's in my business and productivity toolkit?! Find out!! Enter your info and I'll send you the list + Weekly Productivity Chats!! Get the planner I can’t imagine my life or business without!! Need an organized home base for your life and business? Get THE ULTIMATE Trello Course for Female Entrepreneurs!! Take back control of your business and have a life you love with The Ultimate Productivity Toolkit + Weekly Productivity Chats!! I only share about products I personally use and love and think you will, too! !